There is little better on a summer Friday evening than sitting outdoors listening to lilting music of a group like the Irish Wakers, as the sun dips over the cannery museum. At the end of each summer week, wanderers, strolling people or those who just make a point of heading into Steveston after supper, will all have a chance to feast on a variety of toe-tapping music. The Gulf of Georgia Cannery National Historic Site once again starts their affordable Friday night concert series, Music at the Cannery. For the second Friday night of Music at the Cannery on July 20, Vancouver’s Halifax Wharf Rats bring Irish and Scots folk tune with an East Coast twang that turns the concert into a kitchen party. July 27, Rock Line returns to the cannery. Gerry and Trevor Layton mix Brit rock with their own releases. Aug. 3, the long weekend kicks off with vintage music from the Beauty Shop Dolls channeling the spirit of The Andrews Sisters and the Chordettes. The vocal trio help listeners roar through the ‘20s, swing in the ‘40s, twist with the ‘50s and rock on for the ‘60s. Aug. 10 sees the Irish Wakers return by popular demand. Their fusion of Irish and Maritime music got people up dancing in the aisles last year. It was a night when everyone felt like a seafarer as they tapped their toes to the fiddle, the Irish flute, the mandolin, guitar and bodhran. Aug. 24 brings Indie Folk/Roots trio bring you classic Canadiana with Willy Blizzard’s warm sounds of double bass, acoustic and electric guitar, banjo. Inclement weather doesn’t stop the fun. 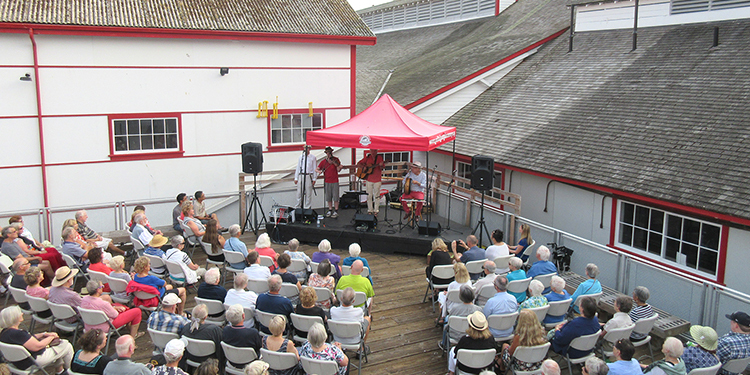 All concerts are planned for the outdoor Tank Deck but, if the weather doesn’t follow the plan, musicians and audience will find themselves indoors, inside the cozy wooden environment of the cannery. Tickets $7 at the door on the night of the concert. Come early to get a seat. If you don’t get into the Tank Deck, you can loiter in the park outside and still hear the music. The museum can be found at 12138 Fourth Avenue at Moncton, (Steveston Village) Call 604-664-9009 for details or check the website.